In chapter 4, we learned that wind blowing out of the subtropical high pressure belts toward the Equator form the northeast and southeast trade winds of the two hemispheres. These trade winds converge in the vicinity of the Equator where air rises. 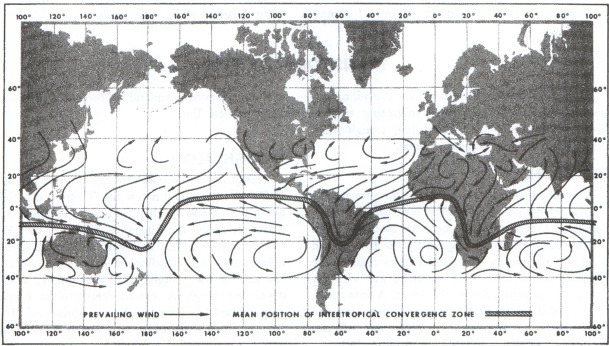 This convergence zone is the “intertropical convergence zone” (ITCZ). In some areas of the world, seasonal temperature differences between land and water areas generate rather large circulation patterns that overpower the trade wind circulation; these areas are “monsoon” regions. Tropical weather discussed here includes the subtropical high pressure belts, the trade wind belts, the intertropical convergence zone, and monsoon regions. If the surface under the subtropical high pressure belts were all water of uniform temperature, the high pressure belts would be continuous highs around the globe. The belts would be areas of descending or subsiding air and would be characterized by strong temperature inversions and very little precipitation. However, land surfaces at the latitudes of the high pressure belts are generally warmer throughout the year than are water surfaces. 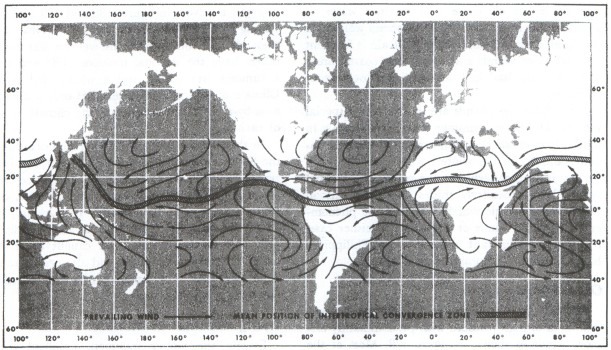 Thus, the high pressure belts are broken into semipermanent high pressure anticyclones over oceans with troughs or lows over continents as shown in figures 23 and 24, chapter 4. The subtropical highs shift southward during the Northern Hemisphere winter and northward during summer. The seasonal shift, the height and strength of the inversion, and terrain features determine weather in the subtropical high pressure belts. Along the west coasts of continents under a subtropical high, the air is stable. The inversion is strongest and lowest where the east side of an anticyclone overlies the west side of a continent. Moisture is trapped under the inversion; fog and low stratus occur frequently. However, precipitation is rare since the moist layer is shallow and the air is stable. Heavily populated areas also add contaminants to the air which, when trapped under the inversion, create an air pollution problem. In winter, the subtropical high pressure belts shift southward. Again, let's consider southern California as an example. In winter, the area comes under the influence of midlatitude circulation which increases frequency of rain. Also, an occasional wintertime outbreak of polar air brings clear skies with excellent visibility. The situation on eastern continental coasts is just the opposite. The inversion is weakest and highest where the west side of an anticyclone overlies the eastern coast of a continent. Convection can penetrate the inversion, and showers and thunderstorms often develop. Precipitation is generally sufficient to support considerable vegetation. For example, in the United States, Atlantic coastal areas at the same latitude as southern California are far from arid in summer. Low ceiling and fog often prevent landing at a west coast destination, but a suitable alternate generally is available a few miles inland. Alternate selection may be more critical for an eastern coast destination because of widespread instability and associated hazards. Under a subtropical high over the open sea, cloudiness is scant. The few clouds that do develop have tops from 3,000 to 6,000 feet depending on height of the inversion. Ceiling and visibility are generally quite ample for VFR flight. An island under a subtropical high receives very little rainfall because of the persistent temperature inversion. Surface heating over some larger islands causes light convective showers. Cloud tops are only slightly higher than over open water. Temperatures are mild, showing small seasonal and diurnal changes. A good example is the pleasant, balmy climate of Bermuda. Figures 138 and 139 show prevailing winds throughout the Tropics for July and January. Note that trade winds blowing out of the subtropical highs over ocean areas are predominantly northeasterly in the Northern Hemisphere and south-easterly in the Southern Hemisphere. The inversion from the subtropical highs is carried into the trade winds and is known as the “trade wind inversion.” As in a subtropical high, the inversion is strongest where the trades blow away from the west coast of a continent and weakest where they blow onto an eastern continental shore. Daily variations from these prevailing directions are small except during tropical storms. As a result, weather at any specific location in a trade wind belt varies little from day to day. FIGURE 138. Prevailing winds throughout the Tropics in July. Remember that in the Southern Hemisphere, circulation around pressure centers is opposite that in the Northern Hemisphere. FIGURE 139. Prevailing winds in the Tropics in January. In the trade wind belt, skies over open water are about one-half covered by clouds on the average. Tops range from 3,000 to 8,000 feet depending on height of the inversion. Showers, although more common than under a subtropical high, are still light with comparatively little rainfall. Flying weather generally is quite good. Where trade winds blow offshore along the west coasts of continents, skies are generally clear and the area is quite arid. The Baja Peninsula of Lower California is a well-known example. Where trade winds blow onshore on the east sides of continents, rainfall is generally abundant in showers and occasional thunderstorms. The east coast of Mexico is a good example. Rainfall may be carried a considerable distance inland where the winds are not blocked by a mountain barrier. Inland areas blocked by a mountain barrier are deserts; examples are the Sahara Desert and the arid regions of southwestern United States. Afternoon convective currents are common over arid regions due to strong surface heating. Cumulus and cumulonimbus clouds can develop, but cloud bases are high and rainfall is scant because of the low moisture content. Flying weather along eastern coasts and mountains is subject to the usual hazards of showers and thunderstorms. Flying over arid regions is good most of the time but can be turbulent in afternoon convective currents; be especially aware of dust devils. Blowing sand or dust sometimes restricts visibility. Mountainous islands have the most dramatic effect on trade wind weather. Since trade winds are consistently from approximately the same direction, they always strike the same side of the island; this side is the windward side. The opposite side is the leeward side. Winds blowing up the windward side produce copious and frequent rainfall, although cloud tops rarely exceed 10,000 feet. Thunderstorms are rare. Downslope winds on the leeward slopes dry the air leaving relatively clear skies and much less rainfall. Many islands in the trade wind belt have lush vegetation and even rain forests on the windward side while the leeward is semiarid. For example, the island of Oahu, Hawaii, is about 24 miles wide in the direction of the trade winds. Annual rainfall averages from about 60 inches on the windward coast to 200 inches at the mountain tops, decreasing to 10 inches on the leeward shore. The greatest flying hazard near these islands is obscured mountain tops. Ceiling and visibility occasionally restrict VFR flight on the windward side in showers. IFR weather is virtually nonexistent on leeward slopes. Islands without mountains have little effect on cloudiness and rainfall. Afternoon surface heating increases convective cloudiness slightly, but shower activity is light. However, any island in either the subtropical high pressure belt or trade wind belt enhances cumulus development even though tops do not reach great heights. Therefore, a cumulus top higher than the average tops of surrounding cumulus usually marks the approximate location of an island. If it becomes necessary to “ditch” in the ocean, look for a tall cumulus. If you see one, head for it. It probably marks a land surface, increasing your chances of survival. Converging winds in the intertropical convergence zone (ITCZ) force air upward. The inversion typical of the subtropical high and trade wind belts disappears. Figures 138 and 139 show the ITCZ and its seasonal shift. The ITCZ is well marked over tropical oceans but is weak and ill-defined over large continental areas. Convection in the ITCZ carries huge quantities of moisture to great heights. Showers and thunderstorms frequent the ITCZ and tops to 40,000 feet or higher are common as shown in figure 137. Precipitation is copious. Since convection dominates the ITCZ, there is little difference in weather over islands and open sea under the ITCZ. Flying through the ITCZ usually presents no great problem if one follows the usual practice of avoiding thunderstorms. He usually can find a safe corridor between storms. Since the ITCZ is ill-defined over continents, we will not attempt to describe ITCZ continental weather as such. Continental weather ranges from arid to rain forests and is more closely related to the monsoon than to the ITCZ. FIGURE 137. 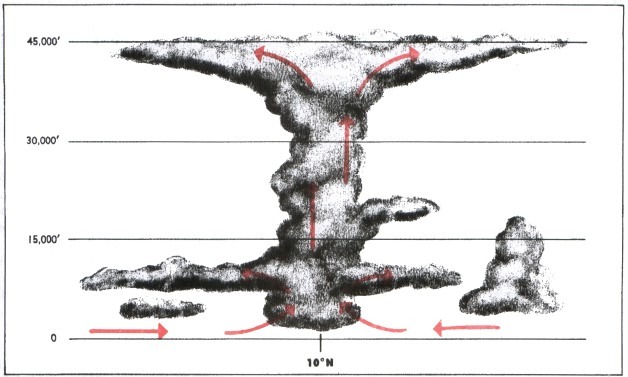 Vertical cross section illustrating convection in the Intertropical Convergence Zone. If you refer again to figures 23 and 24 in chapter 4, you can see that over the large land mass of Asia, the subtropical high pressure breaks down completely. Asia is covered by an intense high during the winter and a well-developed low during the summer. You can also see the same over Australia and central Africa, although the seasons are reversed in the Southern Hemisphere. The cold, high pressures in winter cause wind to blow from the deep interior outward and offshore. In summer, wind direction reverses and warm moist air is carried far inland into the low pressure area. This large scale seasonal wind shift is the “monsoon.” The most notable monsoon is that of southern and southeastern Asia. During the summer, the low over central Asia draws warm, moist, unstable maritime air from the southwest over the continent. Strong surface heating coupled with rising of air flowing up the higher terrain produces extensive cloudiness, copious rain, and numerous thunderstorms. Rainfall at some stations in India exceeds 400 inches per year with highest amounts between June and October. The monsoon is so pronounced that it influences circulation many miles out over the ocean. Note in figure 138 that in summer, prevailing winds from the Equator to the south Asian coast are southerly and southeasterly; without the monsoon influence, these areas would be dominated by northeasterly trades. Islands within the monsoon influence receive frequent showers. Note in figure 139 how the winter flow has reversed from that shown in figure 138. Cold, dry air from the high plateau deep in the interior warms adiabatically as it flows down the southern slopes of the Himalayan Mountains. Virtually no rain falls in the interior in the dry winter monsoon. As the dry air moves off shore over warmer water, it rapidly takes in more moisture, becomes warmer in low levels and, therefore, unstable. Rain is frequent over off-shore islands and even along coastal areas after the air has had a significant over-water trajectory. The Philippine Islands are in an area of special interest. During the summer, they are definitely in southerly monsoon flow and are subjected to abundant rainfall. In the winter, wind over the Philippines is northeasterly—in the transition zone between the northeasterly trades and the monsoon flow. It is academic whether we call the phenomenon the trade winds or monsoon; in either case, it produces abundant rainfall. The Philippines have a year-round humid, tropical climate. Australia in July (Southern Hemisphere winter) is an area of high pressure with predominantly offshore winds as shown in figure 138. Most of the continent is dry during the winter. In January, figure 139, winds are onshore into the continental low pressure. However, most of Australia is rimmed by mountains, coastal regions are wet where the onshore winds blow up the mountain slopes. The interior is arid where down-slope winds are warmed and dried. Central Africa is known for its humid climate and jungles. Note in figures 138 and 139 that prevailing wind is onshore much of the year over these regions. Some regions are wet the year round; others have the seasonal monsoon shift and have a summer wet season and a winter dry season. Climate of Africa is so varied that only a detailed area-by-area study can explain the climate typical of each area. In the Amazon Valley of South America during the Southern Hemisphere winter (July), southeast trades, as shown in figure 138, penetrate deep into the valley bringing abundant rainfall which contributes to the jungle climate. In January, the ITCZ moves south of the valley as shown in figure 139. The northeast trades are caught up in the monsoon, cross the Equator, and also penetrate the Amazon Valley. The jungles of the Amazon result largely from monsoon winds. During the winter monsoon, excellent flying weather prevails over dry interior regions. Over water, one must pick his way around showers and thunderstorms. In the summer monsoon, VFR flight over land is often restricted by low ceilings and heavy rain. IFR flight must cope with the hazards of thunderstorms. Freezing level in the Tropics is quite high—14,000 feet or higher—so icing is restricted to high levels.